2XU know that tri shorts are a really handy bit of kit that almost every athlete needs in order to best adapt to their training and racing. That's why they have designed the Perform tri short, aimed at athletes looking to get the very best out of their performance. The materials used to design this product were engineered at the Royal Melbourne Institute of Technology to ensure that moisture management, muscle stabilisation and comfort was at the forefront of the shorts performance. SBR Power technology compresses muscles within the shorts which help to improve blood flow back to the heart and in turn reduce muscle fatigue and promote faster recovery. 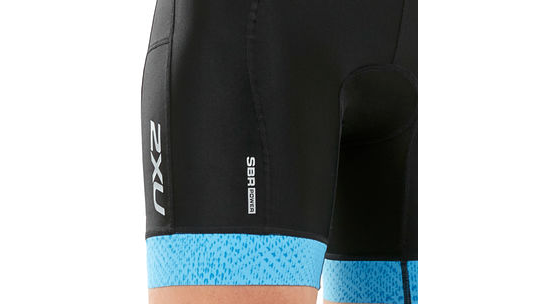 The LD chamois found in these shorts is the highest quality chamois that 2XU produce, offer sustained comfort for the bike and remaining discreet for the run. Built from 70D elastane, SBR Power offers unmatched power, durability and strength. Featuring high-denier nylon yarn for impressive support and moisture management, as well as a mid-level gauge for impressive muscle stabilization. Quick-drying long course triathlon chamois fused onto a high-density, hydrophobic foam base to manage moisture and deliver the comfort required to go the distance. Ample support for the bike while remaining discreet for the run.